Vice President Pence To Visit Nebraska Amid Record Floods Vice President Pence will visit Nebraska on Tuesday to survey damage caused by Midwest floods that have killed at least four people and displaced hundreds. A railroad crossing is flooded with water from the Platte River in Plattsmouth, Neb. Record high floodwaters inundated regions of the Midwest following an intense winter storm and rapid snowmelt. As floodwaters begin to recede, Vice President Pence announced in a tweet that he would visit Nebraska on Tuesday to take stock of the devastation. His visit comes as 74 cities, 65 counties and four tribal areas have declared states of emergency in Nebraska, according to the Nebraska Emergency Management Agency. Additionally, nearly half of Iowa's counties are covered by Gov. Kim Reynolds' disaster proclamations. Water submerged large swaths of those states, as well as parts of Kansas, Missouri, South Dakota and Wisconsin, ravaging farms and swamping homes. At least four people have been killed and hundreds of others have been displaced. White House press secretary Sarah Sanders tweeted that Pence would be joined by Gov. Pete Ricketts of Nebraska and by Reynolds. Reynolds told reporters on Tuesday that the visit would help the vice president get a sense of the severity of the damage caused by floods. She said 41 of Iowa's 99 counties are included in her state disaster declaration. Steve Hespen, the sheriff of Nebraska's Dodge County, told NPR that several levees were breached in the region he patrols after a "bomb cyclone" poured torrents of rain across the region, compounded with snowmelt filling rivers and streams. "I've lived in this area of Dodge County and Fremont all my life and this is the worst flood situation that I've ever encountered," Hespen said. Until Monday evening, flooding around Fremont, Neb., was so severe that traffic was largely cut off from the city as most highway lanes were underwater. Private pilots offered free flights to shuttle stranded residents in and out of the city before roads reopened, The Associated Press reported. The Nebraska Department of Transportation has been updating residents via Twitter regarding road closures and reopenings. Among the areas hardest hit is the agriculture business, Nebraska's leading industry, with the state's Department of Agriculture reporting up to $1 billion in expected damage to farms and livestock. Nebraska Department of Agriculture Director Steve Wellman told reporters that the floods will have ripple effects throughout the country. "We process more red meat here than any other state," he said. Flooding of farms and barns, in addition to last week's blizzard conditions, struck as calving season — the time of year when new calves are born — was underway, he explained. "That could affect the consumer." Wellman said it's still too early to provide a definitive stock of all the damage to the industry, and he reminded reporters that the estimate he provided does not include the significant damage to roads and other infrastructure crucial to transporting products. "I believe recovery will be a long process," he said. This is the latest blow to Nebraska's farmers, who have seen a 60 percent decrease in income in the past five years, Wellman said, and who lost more than $1 billion between June and November of last year because of international trade wars, according to the Nebraska Farm Bureau. 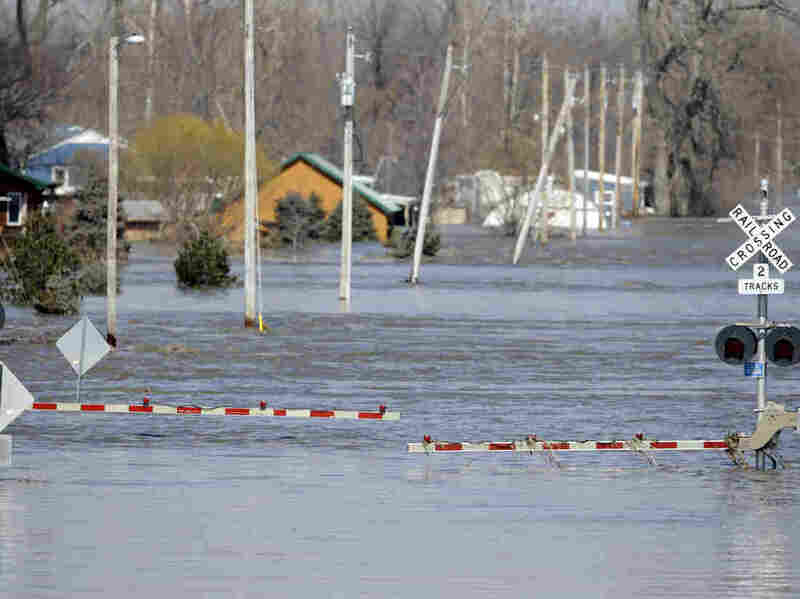 Even as waters recede from parts of the affected areas, the waters of the Missouri River — which runs from South Dakota, along the borders of Nebraska, Iowa and Kansas, and through Missouri — will continue to rise throughout the week as the flooding makes it way downstream. A previous version of this story misspelled the city of Fremont, Neb., as Freemont.